EVERYONE loves pizza, and if you DON’T you’re probably from another planet…or another dimension entirely. But the PWP (Problem With Pizza, not Parents Without Partners) is this: it’s got way too much saturated fat and cholesterol, glycotoxins, is fiber-poor, and REALLY fattening. Who wants to eat it if you have to WEAR it too? Take heart! 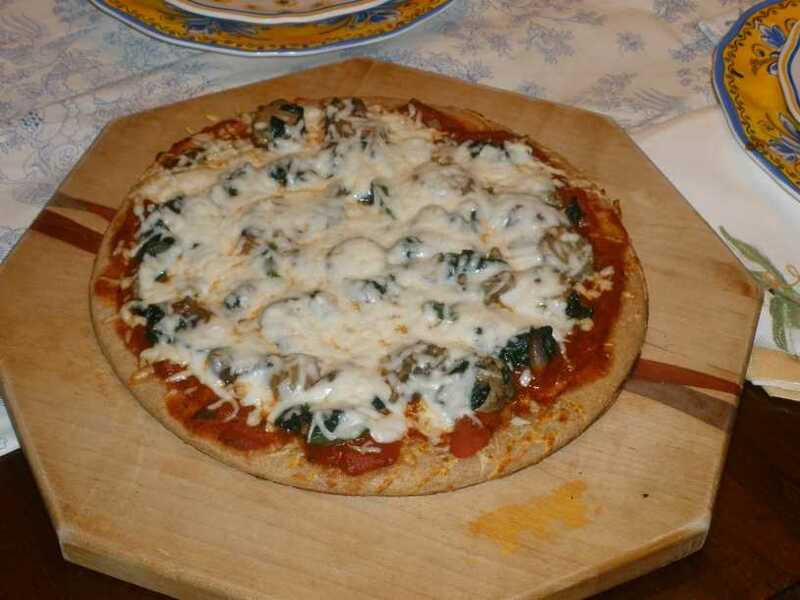 There IS a way to make pizza really healthy and absolutely delicious, high in fiber, and cholesterol-free. And it’s easy too! Preheat oven per Pizza bread instructions. Heat olive oil in skillet; while heating, dice garlic and cut mushroom in small pieces. Cook garlic and mushrooms in oil until done and add spinach and basil. Coat pizza shell with sauce and layer toppings evenly. 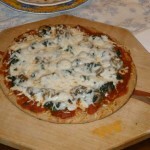 Sprinkle cheese evenly over pie and cook on pizza pan for 8 to 10 minutes. Let cool for 3 minutes, slice and serve. An all-American homemade potato salad, made with a dijon and vegan mayonnaise sauce and vegetarian bacon bits. Boil potatoes in water just until soft. Allow to cool. Whisk together the balsamic vinaigrette and the vegan mayonnaise, then gently toss together with potatoes and other ingredients, except vegetarian bacon bits. Chill. Add vegetarian bacon bits just before serving so that they stay crispy and crunchy. Combine oil, garlic, and lemon zest in small bowl. Set aside. Cook pasta in large pot of boiling, salted water according to package directions. Add squash and bell pepper 4 minutes before end of cooking time. Add broccoli 3 minutes before end of cooking time. Drain pasta and vegetables, reserving 1/2 cup cooking water. In a stockpot over medium-high heat, heat the oil. Add the rice and saute for 2 minutes. Add the spices and black beans. Cook the vegetarian “bacon” in olive oil for a few minutes, just until cooked but not crisp. Cut into bite-sized pieces. Return bacon to the pan along with the mashed tofu, onions, bell pepper, turmeric and soy sauce, stirring to combine. Sautee for a 5 to 7 minutes, stirring frequently and adding more oil if needed. Remove from heat and stir in yeast.